The Home Decorators Collection 56 in. Breezemore marries form and function in this beautifully designed ceiling fan. This fan boasts a powerful DC motor which saves on energy costs by using up to 70% less electricity than standard AC motor fans. The hand-carved wood blades install easily in a flywheel design and the frosted bowl of the light kit simply twists into place to make installation a breeze. Included with this fan is a feature-rich remote control that controls the fan speed and lights as well as airflow direction. The remote also has a comfort breeze setting which will automatically vary the fan's speeds at different intervals to create an organic breeze effect. Another convenient feature of the remote control is the timer function which allows the light and/or fan to be turned off at a predetermined setting. A great transitional accent for any room, the Hampton Bay Adonia Oil-Rubbed Bronze Ceiling Fan is equipped with a bowl-style light fixture with aged-champagne glass and 5-reversible blades in walnut and dark maple. This fan mounts flush, making it great for low ceilings and it features 3-speed, reversible control for year-round comfort. Uses 3-candelabra bulbs up to 40W (included). The Hampton Bay Hawkins 44 in. oil rubbed bronze ceiling fan features a twist-and-lock installation method that offers ease in installation and helps conceal hardware for a sleek, integrated look. The fan's oil rubbed bronze finish, 5 reversible walnut/teak blades and frosted glass light kit provide a transitional style that complements a wide variety of decor styles, and the 3-speed reversible control enables you to select the desired speed and direction of airflow. Update your decor with the modern Home Decorators Collection Renwick 54 in. Brushed Nickel Ceiling Fan. This 3-speed fan features 5 reversible blades to help move air efficiently, with quiet, wobble-free operation. The light kit offers an etched lens and includes an LED to provide brilliant illumination. The handy remote control provides independent light and speed controls. Add an updated look to your transitional decor with the Home Decorators Collection Petersford 52 in. Brushed Nickel Ceiling Fan. This 3-speed fan features 5 reversible blades to help move air efficiently, with quiet, wobble-free operation. The light kit offers a white lens and includes an LED to provide brilliant illumination. The handy remote control provides independent light and speed controls. Breezemore 56-inch 5-Blade 2-Light Mediterranean Bronze Indoor Ceiling Fan with Light Kit and Remote The Home Decorators Collection 56 in. Breezemore marries form and function in this beautifully designed ceiling fan. This fan boasts a powerful DC motor which saves on energy costs by using up to 70% less electricity than standard AC motor fans. The hand-carved wood blades install easily in a flywheel design and the frosted bowl of the light kit simply twists into place to make installation a breeze. Included with this fan is a feature-rich remote control that controls the fan speed and lights as well as airflow direction. The remote also has a comfort breeze setting which will automatically vary the fan's speeds at different intervals to create an organic breeze effect. Another convenient feature of the remote control is the timer function which allows the light and/or fan to be turned off at a predetermined setting. Breezemore 56-inch 5-Blade 2-Light Mediterranean Bronze Indoor Ceiling Fan with Light Kit and Remote is rated 5.0 out of 5 by 7. Rated 5 out of 5 by barril from best ceiling fan feature for feature This is 2nd season for this fan in 18 by 14 room with 10 ' ceiling. It runs 24 7 during this heatwave and its speed has never been above 6. Top speed has never been used. This quiet fan has been trouble free. Highly recommended. Rated 5 out of 5 by Ronald from It's a breeze Easiest fan ever to install. Don't even bother with provided instructions, just watch you tube video. No sound whatsoever from fan motor. Love the variety of options (9 speeds, dimmable light, reverse on remote). Incredibly energy efficient. Last of all, nice looking remote, not the cheap looking white remote which most fans come with. Rated 5 out of 5 by Muskrat from Great features and attractive look Love the simple to use remote handset. Dark wooden blades and simple light look really beautiful in my conservatory/sunroom. Absolutely silent, various speeds/timers/dimming etc. Don't need to stop it to reverse the direction, just press a button on the handset. Easy to install, and this fan is all I need for 19'x14' room. Delighted and impressed! Rated 5 out of 5 by Lori from very quiet It was easy to install, its very quiet & having a remote is very handy. Would highly recommend this fan. Rated 5 out of 5 by Tom Z from Great fan Bought this to replace an older fan that was already installed when I purchased my home and didn't work very well. This new fan is fantastic - lots of great features, easy to install, nice looks, really moves a large amount of air, but best of all it's super quiet. I use the room where it's installed as an office and I don't like noisy distractions. Highly recommend this fan -- worth the asking price. Rated 5 out of 5 by Theodore 27 from Moves a lot of air and is extremely quiet. We find this ceiling fan perfect for our large bedroom. The variable speed and remote control make it easy to use and to have just the right amount of circulation. It is extremely quiet. All you can hear is the sound of the air moving even at maximum speed. 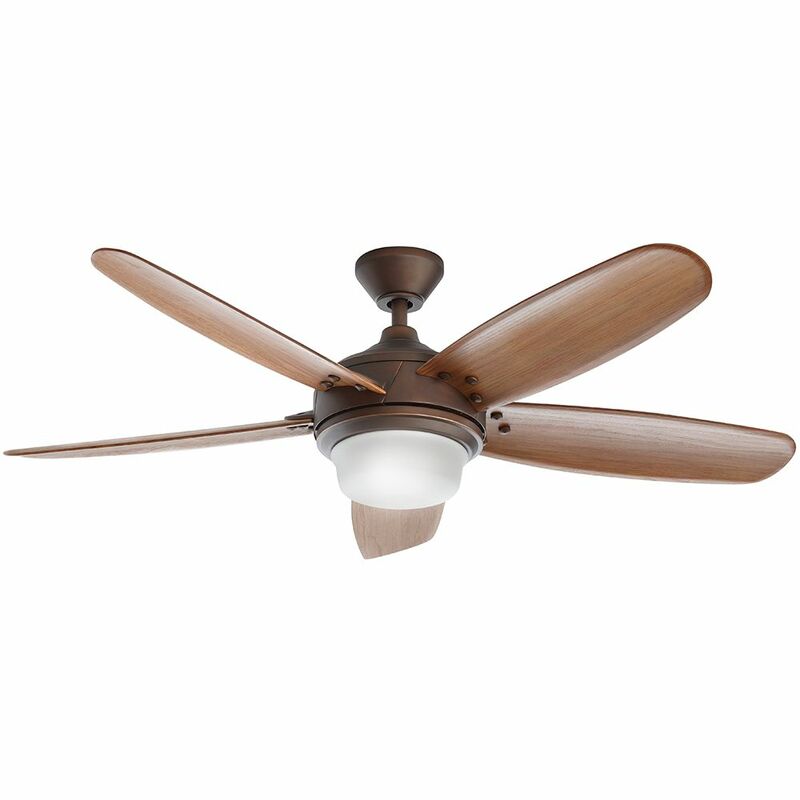 Rated 5 out of 5 by Wylie from Best value out there for a DC motor ceiling fan Buy this fan! !Researched quite a bit for the energy efficient DC driven ceiling fans and this unit has all the features I wanted for a third of the price of most others out there. Dimable lights and the reverse option both from the remote, 9 speeds, surge breeze, timer. Easy install, expect an hour and instructions were decent. Absolutely silent and trust me...it moves the air!! My great room has a 20 foot high vaulted ceiling, 32 feet by 12 feet in size and it creates a nice noticeable breeze. Decent looking with real wood blades that will match any decor. Little tricky pairing the remote, make sure you read the manual about this or your remote won't work.There is a switch inside the battery compartment to shut off the dimming feature if you wish or if your not planning on using dimmable CFB or LED type bulbs. I used two dimmable 60 watt LED bulbs. Not enough to light up the room but adds a nice glow. The remote also has a a nice feature of with a graduated light bar to show graphically the speed setting. Also, unlike AC motor fans the DC drives are a bit slower at start up. takes a few seconds to begin moving and takes about 10-15 seconds to get up to full speed, be patient. Can the light be dimmed 8f an appropriate bulb is installed? Yes. Ours came with an incandescent lamp and the remote has the dimming feature which works a treat. It should work with any dimmable lamp of appropriate base and physical size though the manufacturer would be the final arbiter on this topic. Can this fan be installed without a downrod? my ceiling is just under 8ft, I am 6ft 6 in, having the bottom of the light bowl 17inches lower than the ceiling will make for a sore head. If not I will have to return this. Thank you for your question. Unfortunately, this fan can not be installed without the downrod. We purchased this fan but need a 48 or 60&quot; downrod. There are only 12, 24 and 36&quot; available in-store or on-line. Where or how can I purchase a longer downrod? Thanks. Thanks - found a 48&quot; at a different store. Can this fan be installed with a shorter downrod? What is the exact full depth from ceiling to bottom of light? Thx in advance. Thank you for your question. The included 4.5&quot; downrod is the shortest recommended downrod. The assembled height of the fan is 17&quot;. Thank you for your question. This fan is only sold with the included light kit and it must be installed with the light kit. Can you purchase a different still of bowl? Thank you for your question. At this time, there are no alternate light bowls that are compatible with the Breezemore fan. How do I go about buying downrods? What is the price? Thank you. Thank you for your question. This fan is compatible with any 3/4&quot; diameter threaded downrod. The Home Depot carries a wide selection of downrods in a variety of lengths. This fan s compatible with downrods up to 48 inches long. Downloads are also available online. Does this fan also come with a 'no light' option? Thank you for your question. This fan's light kit is integrated into the housing design and it can not be installed without the light kit. At this time, there is not a version of this fan that comes without a light kit. The closest would be the 68&quot; Altura DC. That fan has similar blades and a DC motor.